The site is located within the grounds of Warwickshire Cricket Club in Edgbaston, Birmingham and occupies 0.45 hectares. The site is bounded to the north by residential properties, to the south by buildings / stands and to the west by a grassed area of land belonging to WCC. The eastern side of the site is bounded by the River Rae, which is 2-3m below the level of the site. The site has planning permission for the development of residential properties – this is the first phase of the overall development which will comprise of 79 three and four bedroom houses. GIP had previously carried out site investigations which confirmed the presence of elevated hydrocarbon and metal concentrations in both soil and groundwater in excss of generic screening criteria. GIP determined that metallic pollutants (particularly lead and arsenic), total petroleum hydrocarbons [TPH], trimethylbenzene and polycyclic aromatic hydrocarbons [PAHs] were present in shallow made ground at concentrations that potentially posed a risk to human health. In the eastern part of the site a TPH concentration of 16,200 mg/kg was noted (in close proximity to the River Rea). GIP also determined that TPH and PAHs were present in groundwater at concentrations which potentially posed a risk to controlled waters. TPH and PAHs were identified at maximum concentrations of 26,400µg/l and 1,250µg/l respectively. Other pollutants were present at concentrations marginally above the generic screening criteria for protection of controlled waters. There was no recorded historical activity on the site to indicate the source of the contamination. 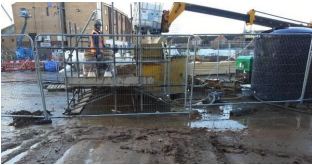 It is understood that there is an offsite TPH contamination source migrating onto the site and that the TPH contamination may also be due to the site being previously utilised as a vehicle parking area. The PAH and metal contamination is assumed to be associated with imported fill material historically used onsite for level raising purposes.